In this tutorial we will basically implement the domain model language again, but this time we will make use of the special JVM support shipped with Xtext 2.x. This kind of language really is a sweet spot for DSLs, so feel free to use this as a blueprint and add your project specific features later on. As you can see, it supports all kinds of advanced features such as Java generics and full expressions, even including lambda expressions. Don’t panic, you will not have to implement these concepts on your own but will reuse a lot of helpful infrastructure to build the language. We will now walk through the five little steps needed to get this language fully working including its compiler. The first three steps are very similar to those in the 15 Minutes Tutorial. 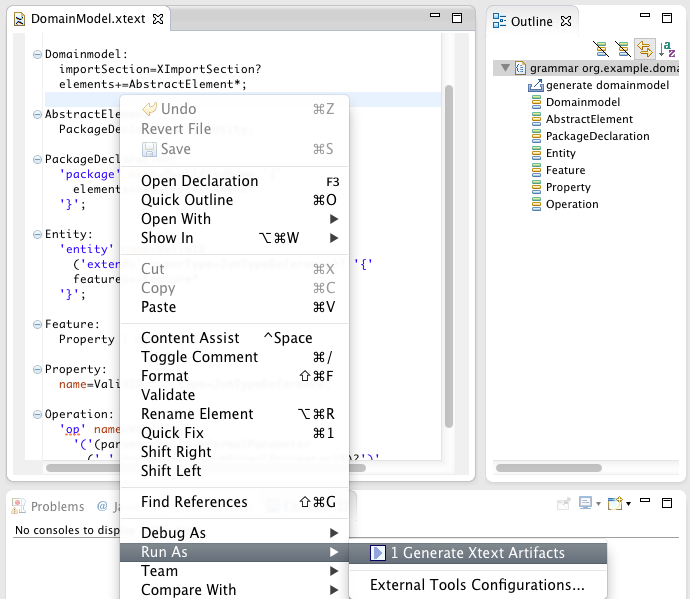 After you have installed Xtext on your machine, start Eclipse and set up a fresh workspace. Choose a meaningful project name, language name and file extension, e.g. Click on Finish to create the projects. After you have successfully finished the wizard, you will find five new projects in your workspace. Some parts of this grammar are equal to the one in the 15 Minutes Tutorial, but other parts are different. The first thing to note is that instead of inheriting from the usual org.eclipse.xtext.common.Terminals grammar, we make use of org.eclipse.xtext.xbase.Xbase. Xbase allows us to easily reuse and embed modern, statically typed expressions as well as Java type signatures in our language. A Domainmodel contains an optional import section and an arbitrary number of AbstractElements. The concept of XImportSection is part of org.eclipse.xtext.xbase.Xbase and comes with tool support and syntax like you know it from Java. The rule AbstractElement delegates to either the rule PackageDeclaration or the rule Entity. A PackageDeclaration is used to declare a name space which can again contain any number of AbstractElements. Xtext has built-in support for qualified names and scoping based on the hierarchy of the produced model. The default implementation will add the package names as the prefix to contained entities and nested packages. The qualified name of an Entity ‘Baz’ which is contained in a PackageDeclaration ‘foo.bar’ will be ‘foo.bar.Baz’. In case you do not like the default behavior you will need to use a different implementation of IQualifiedNameProvider. The rule Entity starts with the definition of a keyword followed by a name. The extends clause makes use of the rule JvmTypeReference which is defined in a super grammar. JvmTypeReference defines the syntax for full Java-like type names. That is everything from simple names, over fully qualified names to fully-fledged generics, including wildcards, lower bounds and upper bounds. Finally between curly braces there can be any number of Features, which leads us to the next rule. The rule Feature delegates to either a Property or an Operation. A Property has a name and makes again use of the inherited rule JvmTypeReference. Operations also have a signature as expected. Note that also for formal parameters we can reuse a rule from the super grammar. return "Hello World" + "!" Run As → Generate Xtext Artifacts. This action generates the parser and text editor and some additional infrastructure code. You will see its logging messages in the Console View. The syntax alone is not enough to make the language work. We need to map the domain-specific concepts to some other language in order to instruct Xtext how it is executed. Usually you define a code generator or an interpreter for that matter, but languages using Xbase can omit this step and make use of the IJvmModelInferrer. The idea is that you translate your language concepts to any number of Java types (JvmDeclaredType). Such a type can be a Java class, Java interface, Java annotation type or a Java enum and may contain any valid members. In the end you as a language developer are responsible to create a correct model according to the Java language. By mapping your language concepts to Java elements, you implicitly tell Xtext in what kind of scopes the various expressions live and what return types are expected from them. Xtext 2.x also comes with a code generator which can translate that Java model into readable Java code, including the expressions. Let’s go through the code to get an idea of what is going on. (Please also refer to the JavaDoc of the used API for details, especially the JvmTypesBuilder). Using the dispatch keyword makes sure that the method is called for instances of type Entity only. Have a look at the Xtend documentation on polymorphic dispatch to understand Xtend’s dispatch functions. Extending AbstractModelInferrer makes sure we don’t have to walk the syntax model on our own. Every JvmDeclaredType you create in the model inference needs to be passed to the acceptor in order to get recognized. The extension method toClass comes from JvmTypesBuilder. That class provides a lot of convenient extension methods, which help making the code extremely readable and concise. It is important to understand that the creation and assignment of a qualified name is done in an early phase where the compiler collects all global symbols. You cannot resolve type references at this point. Here we assign some JavaDoc to the newly created element. 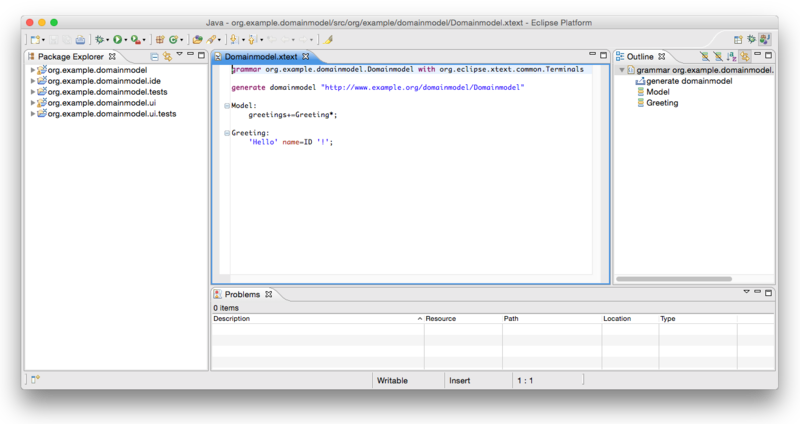 The assignment is translated to an invocation of the method JvmTypesBuilder.setDocumentation(JvmIdentifiableElement, String), and element.documentation is in fact calling the extension method JvmTypesBuilder.getDocumentation(EObject). Such extension methods are explained in detail in the Xtend documentation. Set the superType on the inferred element. Note that we have to clone the type reference from the element.superType. If we did not do that, the type reference would be automatically removed from the element, as superType is an EMF containment reference. When iterating over a list of heterogeneous types, the switch expression with its type guards comes in handy. If feature is of type Property the first block is executed. If it is an Operation the second block is executed. Note that the variable feature will be implicitly casted to the respective type within the blocks. For each Property we create a field as well as a corresponding getter and setter. Operations are mapped to a corresponding Java method. The documentation is translated and the parameters are added within the initializer. The line body = feature.body registers the Operation’s expression as the body of the newly created Java method. This defines the scope of the expression. The framework deduces the visible fields and parameters as well as the expected return type from that information. Step Five : Try the Editor! 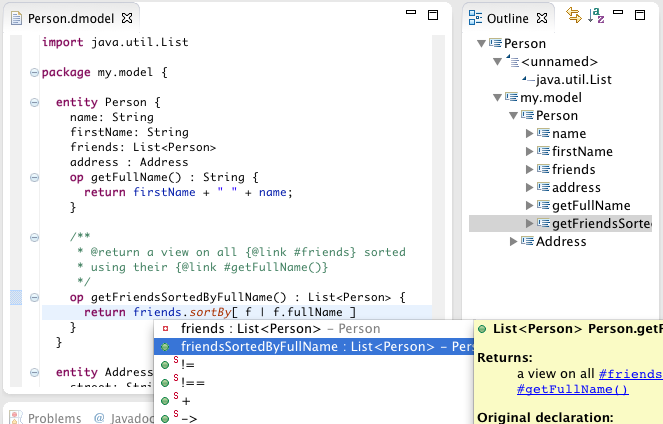 We are now able to test the IDE integration by spawning a new Eclipse using our plug-ins: right-click the project org.example.domainmodel in the Package Explorer and select Run As → Eclipse Application. 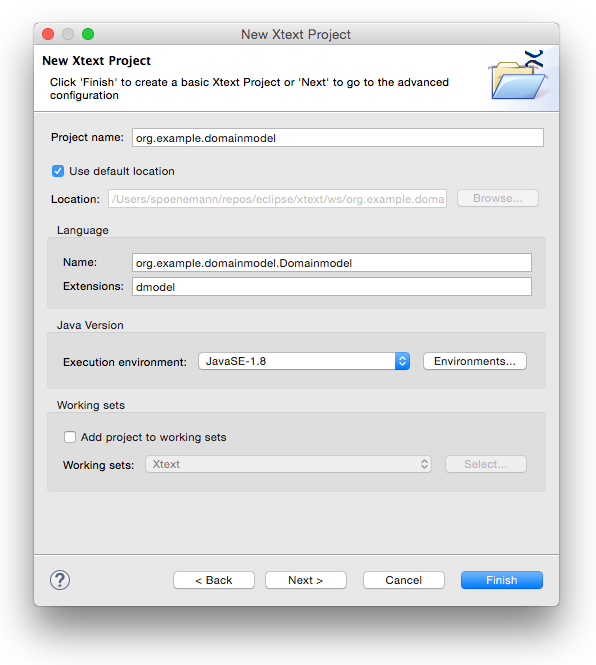 In the new workbench, create a Java project (File → New → Project… → Java Project). Xbase relies on a small runtime library on the class path. To add this, right-click on the project and go to Java Build Path → Libraries → Add Library and choose Xtend Library. Then create a new file with the file extension you chose in the beginning (*.dmodel) in the source folder of the Java project. This will open the generated entity editor. Try it and discover the rich functionality it provides. You should also have a look at the preferences of your language to find out what can be individually configured to your users needs.